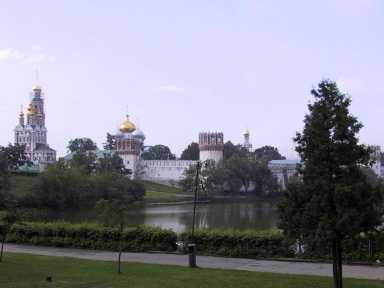 Novodevichy Convent, also known as Bogoroditse-Smolensky Monastery is probably the best-known cloister of Moscow. Its name, sometimes translated as the New Maidens' Monastery, was devised to differ from an ancient maidens' convent in the Moscow Kremlin. Unlike other Moscow cloisters, it has remained virtually intact since the 17th century. In 2004, it was proclaimed a UNESCO World Heritage Site. 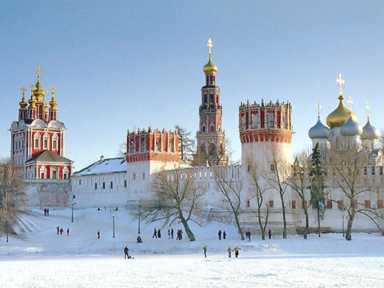 The Novodevichy Convent was founded in 1524 by Grand Prince Vasili III in commemoration of the conquest of Smolensk in 1514. 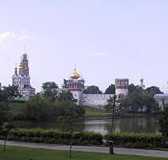 It was built as a fortress at a curve of the Moskva River and became an important part of the southern defensive belt of the capital, which had already included a number of other monasteries. Upon its founding, the Novodevichy Convent was granted 3,000 rubles and the villages of Akhabinevo and Troparevo. Ivan the Terrible would later grant a number of other villages to the convent. The Novodevichy Convent was known to have sheltered many ladies from the Russian royal families and boyar clans, who had been forced to take the veil, such as Feodor I's wife Irina Godunova (she was there with her brother Boris Godunov until he became a ruler himself), Sophia Alekseyevna (Peter the Great's sister), Eudoxia Lopukhina (Peter the Great's first wife), and others. In 1610-1611, the Novodevichy Convent was captured by a Polish unit under the command of Aleksander Gosiewski. Once the cloister was liberated, the tsar supplied it with permanent guards (100 Streltsy in 1616, 350 soldiers in 1618). By the end of the 17th century, the Novodevichy Convent had already possessed 36 villages (164,215 desyatinas of land) in 27 uyezds of Russia. In 1744, it owned 14,489 peasants. In the mid-17th century, they transferred the nuns from other Ukrainian and Belarusian monasteries to the Novodevichy Convent. In 1721, some of the aged nuns, who had done away with the Old Believers movement, were given shelter there. In 1724, the monastery housed a military hospital for the soldiers and officers of the Russian army and an orphanage for female foundlings. By 1763, the convent housed 84 nuns, 35 lay sisters, and 78 sick patients and servants. Each year, the state provided the Novodevichy Convent with 1,500 rubles, 1,300 quarters of bread, and 680 rubles and 480 quarters of bread for more than 250 abandoned children. In 1812, Napoleon's army made an attempt to blow up the convent, but the nuns managed to save the cloister from destruction. In Tolstoy's War and Peace, Pierre was to be executed under the convent walls. In another novel of his, Anna Karenina, Konstantin Lyovin (the main character) meets his future wife Kitty ice-skating near monastery walls. Indeed, the Maiden's Field (as a meadow in front of the convent came to be known) was the most popular skating-rink in 19th-century Moscow. Tolstoy himself enjoyed skating here, when he lived nearby, in the district of Khamovniki. In 1871, the Filatyev brothers donated money for a shelter-school for the orphans of "ignoble origins". Also, the convent housed two almshouses for nuns and lay sisters. In early 1900s, the Cathedral was surveyed and restored by architect and preservationist Ivan Mashkov. By 1917, there had been 51 nuns and 53 lay sisters in the Novodevichy Convent. In 1922, the Bolsheviks closed down the Novodevichy Convent (the cathedral was the last to be closed, in 1929) and turned it into the Museum of Woman's Emancipation. By 1926, the monastery had been transformed into a history and art museum. In 1934, it was affiliated with the State Historical Museum. Most of its facilities were turned into apartments, which was what spared the convent from destruction. In 1943, when Stalin started to make advances to the Russian Orthodox church, he sanctioned the opening of the Moscow Theological Courses at the convent. Next year the courses were transformed into the Moscow Theological Institute. In 1945, the Soviets returned the Assumption Cathedral to the believers. 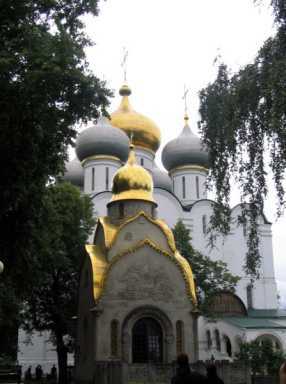 The residence of the Metropolitan of Krutitsy and Kolomna has been located in the Novodevichy Convent since 1980. In 1994, nuns returned to the convent, which is currently under the authority of the Metropolitan of Krutitsy and Kolomna. Some of the churches and other monastic buildings are still affiliated with the State Historical Museum. In 1995, they resumed service in the convent on patron saint's days. The oldest structure in the convent is the six-pillared five-domed cathedral (picture), dedicated to the icon Our Lady of Smolensk. Extant documents date its construction to 1524-1525; yet its lofty ground floor, magisterial proportions, and projecting central gable are typical of monastery cathedrals built at the behest of Ivan the Terrible. Most scholars agree that the cathedral was rebuilt in the 1550s or 1560s; it was formerly ringed by four smaller chapels, in an arrangement reminiscent of the Annunciation Cathedral in the Kremlin. Its frescos are among the finest in Moscow. The cathedral may be a focal point of the monastery, but there are many other churches. Most of them date from the 1680s, when the convent was thoroughly renovated at the behest of the regent Sophia Alexeyevna (who, ironically, would be incarcerated there later). The blood-red walls and crown-towers, two lofty over-the-gates churches, a refectory, and residential quarters were all designed in the Muscovite Baroque style, supposedly by a certain Peter Potapov. In the old cathedral, a new bowl for holy water and gilded carved iconostasis were installed in 1685. Its four tiers contain 16th-century icons endowed by Boris Godunov; the fifth tier displays icons by leading 17th-century painters, Simeon Ushakov and Fyodor Zubov. 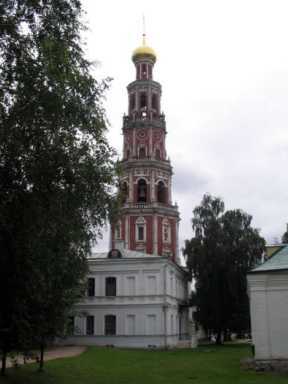 An arresting slender belltower, also commissioned by Sophia, was built in six tiers to a height of 72 metres, making it the highest structure in 18th-century Moscow (after Ivan the Great Bell Tower). This light octagonal column seems to unite all major elements of the ensemble into one harmonious whole. This page was retrieved and condensed from (http://en.wikipedia.org/wiki/Novodevichy_Convent) see Wikipedia, the free encyclopedia, January 2008. This information was correct in January 2008. E. & O.E.